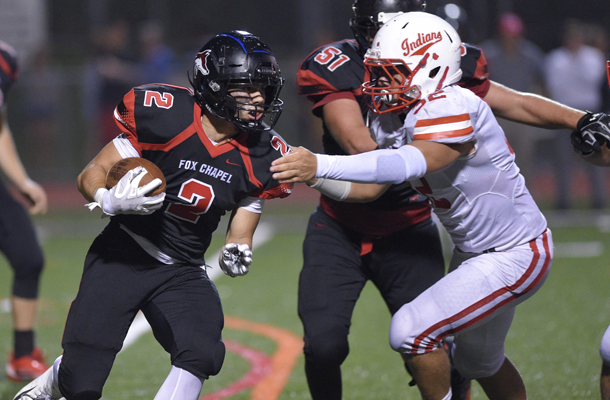 During the first play of the Foxes’ first football game last season, then sophomore Sam Brown made a tackle that he won’t soon forget. Despite his injury, Sam made the best of the unfortunate situation. He gave moral support to his teammates by attending almost every practice and all of the team’s games. While his six-month recovery taxed him both physically and mentally, Sam was elated when he was cleared for full activity six months later, but his excitement was short-lived when he re-injured his shoulder again. This time it had nothing to do with football. Throughout it all, Sam never once considered giving up the game. Although his injury prevented him from doing upper-body weightlifting for months, Sam remained a regular at the team’s weight-room training. He was able to keep up his strength by doing some legwork, but spent a lot more time devouring the playbook in preparation for the 2018 season. His much-anticipated return, this time as a running back, occurred nearly a year after his original injury. 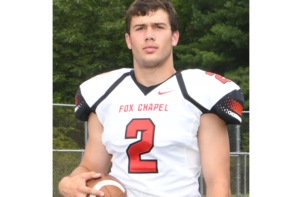 While the Foxes dropped their first competition to North Hills on August 31, the game represented an amazing personal victory for Sam and was a true testament of his will and character. Although his technique and body composition differ from 2018 graduate Micah Morris, the program’s all-time leading rusher who set a slew of records last season, Coach Loughran sees a similarity in the two. For someone with such an intense desire to succeed, it’s only natural that the 6’1” junior has set some lofty goals for himself. Ultimately, Sam hopes to play in college and would love to play safety. But for now, he’s just thrilled to be sharing the field with his teammates and contributing to the game.